I was wondering if you were free this evening to talk to Sky News about the Birmingham City University MA Course on Social Media – I saw you had blogged about it today. We were hoping to talk to you at 7:15pm this evening – we have a studio in Birmingham we could use. I missed it. Whilst my hotmail is guaranteed to be picked up within an hour, my university account languishes unread for days on end as people fill it with notices about filing cabinets and lectures I’m not interested in. This isn’t the first time I’ve thought I need to update my ‘About Me’. My referring to ‘so-called’ web 2.0 technologies has led to the term being carried over into a THE article; whilst not explicitly emphasising that I’m a ‘Doctor’ means that my opinion probably carries less authority than the ‘Doctor’ from a history department. Therefore I have finally made a few changes. Gone is the ‘so-called’, ‘research fellow’ has been replaced with ‘post-doctoral researcher’, and most importantly my preferred email address is clearly visible! I’m not sure whether I would have said yes or no to Sky News, but it would have been nice to have the choice. Whilst Google Street View has been around for a while, today it launched for 25 cities in the UK. I haven’t previously been much concerned with Google Street View; clever, interesting, but not really applicable to my life. However, one of the 25 uk cities included today is Norwich, the city I grew up in but left many years ago. ‘Memory lane’ doesn’t really do justice to the scope of nostaligia that can be evoked by Google Street View…before today the world would have missed out on a history of places I worked in my youth! Obviously the world wasn’t missing much. Increasing amounts of information is not necessarily a good thing, it depends how you use it. Should all academics be required to have a blog? Whilst I don’t think there would be much gained from all academics Twittering their days away, I think there is a need for a change in the academic attitude to the blog. Despite the blog being one of the earliest examples of social media, great swathes of academia have failed to adopt the technology (or have adopted it in an extremely safe manner, i.e, ‘the research project blog’). Is it because it is a technology without purpose, or is it because it opens an academic’s opinions up to the sort of scrutiny that would otherwise be lacking? As this is my 398th Webometric Thoughts’ blog post, readers will not be surprised that I am a fan of the blog. I am a natural blogger in that I am always happy to proclaim my opinion, no matter how outrageous it may appear to others (…you don’t want to get me started on vegetarianism). But shouldn’t all academics be natural bloggers? Up and down the country academics are constantly proclaiming their opinions in lecture theatres, journals, books, and conferences, but relatively rarely in blogs. As blogs provide an opportunity for the sharing of opinions far beyond the academic community, and engaging in debate today rather than in six months time, surely blogging should be a part of every academics output. Whilst debate is an essential part of scientific progress, I am always surprised by the lack of scientific debate. Whilst I have heard of great debates conducted through the letters pages of eminent scientific journals, and have occassionally seen the rigerous questioning of a paper presented at a conference, in general most scientific publications pass with very little debate. Academics are generally a pleasant bunch, and if you don’t make many waves, noone will bother you. After all, hardly anyone will read your paper anyway. The blogosphere, on the other hand, is a very different beast. It thrives on debate, to the point that some people surf around merely looking for someone to argue with! Wouldn’t it be good for both the arts and sciences if academics were forced to defend their ideas in the blogosphere more often? Especially those which are seemingly indefensible. Free Public Lecture, Tuesday 31 March, 6pm, University of Wolverhampton (Room MC 001). Dr. Mick Grierson is an experimental artist specialising in real‐time interactive audiovisual research, with a specific focus on cognition and perception. He works in film, music, and software development, both inside and outside industry, designing, developing and producing new approaches to creating audiovisual experience. In addition to working in traditional roles in film and television, he has designed commercial audiovisual software for the entertainment industries, which has led to several high profile commissions, including title design and digital audiovisual installations for the hit T.V. show Derren Brown: Tricks of the Mind. demonstrating his Brain Computer Interface for Music to the BBC. In addition, he is lead developer on the Mabuse Real‐time Audiovisual Composition Software Environment. 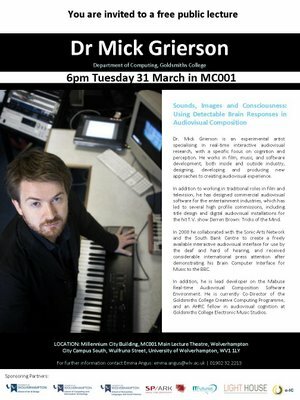 He is currently Co‐Director of the Goldsmiths College Creative Computing Programme, and an AHRC fellow in audiovisual cognition at Goldsmiths College Electronic Music Studios. No longer do those interested in social media in the Black Country have to travel through to Birmingham; the Black Country now has its own Social Media Cafe! First (open) meeting: Tuesday 7th April, 2.30pm, Alchemy, Wolverhampton(see map below). Today a select gathering came together in a Wolverhampton coffee shop to discuss how they could adapt the Social Media Cafe model of the Tuttle Club to the needs of the Black Country. Unsurprisingly a dozen people (more than I had originally expected) have a dozen different ideas. What we all agreed upon was that a Black Country Social Media Cafe could only be a good thing for the area, and that the best way to start was a monthly, daytime meeting. There was also a lot of enthusiasm for special interest splitter groups, as well as less formal meetings out of work hours. So it is, without a doubt, only the start. The Social Media Cafe is all about making connections and sharing information; two fundamentals for innovation. So if you are in the region, and are interested in social media, or just want to find out more about social media, feel free to come along for a coffee and a chat. The official Black Country Social Media Cafe blog and wiki will soon be open for updates and user-contributions. Thanks to everyone who came along today. Argos Complaints: What is the Social Web Solution? 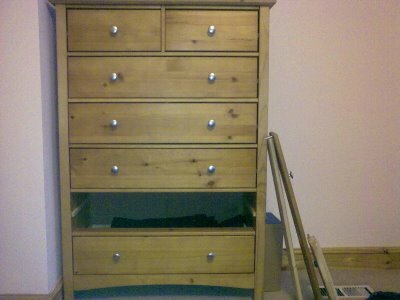 My girlfriend has just finished writing a letter to Argos complaining about a chest of drawers that arrived with a missing part. After two months of being informed that the part was on it’s way, she has now been informed that the part is not available and that she will have to dismantle the chest of drawers if she wants it collected so she can get a refund. The offered recompense for building and dismantling a chest of drawers and two months of inconvenience, a £10 Argos voucher! Whilst the social web can be a useful tool for getting results when numerous people have been inconvenienced, how can it help a single customer find a solution when large corporations are being unreasonable? And is Argos being unreasonable asking for the chest of drawers to be dismantled? [UPDATE 09/03/09] Then unexpectedly we wake up this morning to find the drawer-base sitting on the doorstep! We won’t be ordering furniture from Argos again. Whilst it is currently only for Internet Explorer, a Firefox version should be on its way. My one real criticism of this simple and useful application is the lack of quotation marks. It’s an app all about quotations yet fails to highlight the fact the tweets are quotations. Quotation marks should be the default.